John Daniel Borde, had poured kerosene on his sister, who was unconscious in a car, and set her ablaze. PUNE: The Hinjewadi police on Saturday arrested a 40-year-old man for murdering his sister in cold blood last September. The suspect, John Daniel Borde, had poured kerosene on his sister, who was unconscious in a car, and set her ablaze. He then tried to pass it off as an accident, but it was a technical detail — traces of kerosene in the car’s remains — that helped the police crack the case. “Our investigation has revealed Borde, a resident of Rahatni, murdered his sister, Sangeeta Manish Hiwale (44), to claim her Rs30 lakh life insurance,” Hinjewadi police inspector Ajay Joagdand said on Saturday. The victim’s mother was the nominee in the life insurance policy. Borde will remain in police custody remand for four days. Borde had claimed that he, along with his mother Maya and Sangeeta’s 15-year-old son Symon, was taking her to a hospital in the car, when it developed a snag on the service road of the Katraj-Dehu Road bypass. Borde, Symon and Maya stepped out of the car when it caught fire. Borde, who works in an automobile service station, had told the police the fire engulfed the entire car within minutes. Symon and he sustained minor burn injuries as they tried to rescue Sangeeta. Maya was standing a little distance away and was unhurt. The fire brigade had doused the flames and removed Hiwale’s charred body from the car. 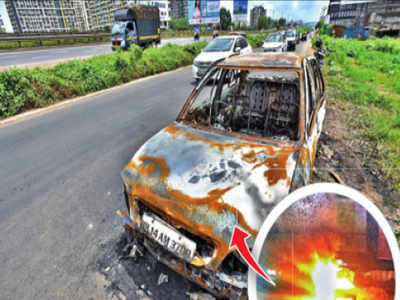 At the time, the police registered a case of accidental death and launched a probe into how the car, which was fitted with a CNG kit, had caught fire. It was on this point that the entire case turned. “Borde was initially summoned for questioning, but we did not suspect foul play as his behaviour appeared normal,” inspector Joagdand said. However, a chemical analysis of the samples collected by the police found traces of kerosene. “When we summoned Borde again and confronted him with the report, he failed to offer an explanation. Under sustained interrogation, Borde broke down and confessed to murdering his sister,” Joagdand said. According to his statement, Borde and his ailing sister quarrelled around 9pm on September 9, 2018, as she wanted Rs40,000. Borde, in a fit of anger, hit her and smashed her head on the floor. Maya and Symon were not at home. “He then put her in the car and asked his mother and nephew, when they returned, to accompany him to the hospital,” Joagdand said. On the way, Borde stopped the car, claiming it developed a snag. He open its bonnet and told his nephew to stand by it, while Borde’s mother got down and walked some distance away. “He made sure neither his nephew nor his mother could see him and poured kerosene on his sister and the car and set it ablaze,” Joagdand said.